Kelch Turf Farms was founded in 1939 by Laverne & Mary Kelch. With just one dump truck and one employee Laverne started trucking coal before and during W.W.II. With experience as a groundskeeper at a local country club Laverne took his knowledge and equipment one step further...he began installing lawns for Peoria area customers. 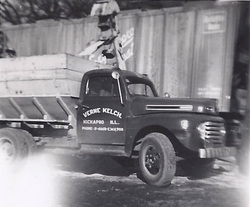 After retirement in 1974 his son, Daniel E. Kelch, became owner of Kelch Turf Farms and Landscaping. Throughout the 70's, 80's, and 90's he laid the foundation for the present success the company enjoys today. In the late 90's Dan's three children, Chad, Jaime, and Lindsay have become the third generation of Kelch's to continue the values of honesty, integrity, and customer service that are embodied in each employee today. Kelch Turf Farms has been producing quality turf products for many years. Our current sod operations consist of three separate sod farms. The first of our sod farms is located one mile west of Kickapoo on Rt. 150. It was purchased in 1955 and consists of 20 acres. This farm is the current location of our office and the base of our operation. The second sod farm is located on Rt. 8 just outside of Oak Hill and consists of 70 acres which was purchased in 1960. In 1965, a lake was constructed in the center of this farm to allow for proper irrigation to all the sod fields surrounding it. In order to keep up with out supply of sod to our customers, the third of our sod farms was purchased in 2006. This farm consists of 100 acres, bringing our total acreage to 190 acres. The sod industry has changed drastically over the years. When the business first began, sod was harvested using the kick sod cutter and hand located onto the trucks for delivery. Then came the power hand sod cutter which still had to be hand loaded. In 1977 our first tractor operated sod harvester was purchased which was an A3A Brouwer Sod Harvester. In 2001 we updated our equipment with a brand new Poyntz Sod Harvester. As time changed and sod demands grew, we purchased Harvestack Sod Harvester in 2010. The Harvestack fully automated sod machine that cuts/rolls/and stacks on pallets operated by one person. Kelch Turf Farms & Landscaping is dedicated to providing quality turf products to our customers.